Driven by changing market demand and to meet increasing compliance and regulatory obligations it is mandatory to have electronic record keeping systems in biopharmaceutical, food, beverages and personal care product industries. In an era of digital technology, when automation of processes increases productivity and reduces costs, the manufacturing industry still generates mountains of paperwork. These paper processes can result in liability concerns and difficulty in controlling and monitoring changes, updates, and approvals. Manually signing these documents is a long process that can take days to complete, thereby significantly hindering processes. When it comes to managing this process data, the one thing everybody will agree is that there's endless number of data out there and the amount is getting larger and more unmanageable all the time. Most plants generate mountains of data, but without the right software capabilities to make the information content quickly available to the right people at time that is relevant to the manufacturing process, the data remains essentially untapped. How can manufacturers possibly handle the mountains of data that relate to both focal areas — quality with regulatory compliance (GMP) and operational/process stability? Today companies are looking out for solutions that can automate data collection, paper-based procedures, meet increasing compliance and regulatory obligations and reporting needs-from FDA Regulation 21 CFR Part 11, or Compliant Batch End reports The shift from manual record-keeping to electronic records and measurements improves the accuracy and usability of collected data. Digital recording solutions collect real time data from various sources, aggregates, and analyze current and historical process information at multiple manufacturing locations, in real-time. It generates production reports based on both real-time and historical data, from internal and external sources, such as relational and web service data. Report templates may be based on batch or time range. For batch process manufacturers, comprehensive systems are available to generate electronic batch reports that comply with regulatory requirements, incorporating all steps from data collection through report generation to sign-off. For continuous manufacturers, reports may be configured based on hierarchical time frames or interrelated time ranges. The system maintains all data at its original fidelity, offers a full audit trail of data and user security changes, and features stringent versioning to remove errors, align reports with production, and support auditing. It also supports electronic signatures for efficient report approval. Authorized users can access reports online by means of secure Web services. Another feature is Dynamic Reporting which enable automatic report generation of details by using built-in trending, tabular data output and statistical features. Easy access to the data also helps shorten process start-up, scale-up, troubleshooting and adverse trend reversal times; improve productivity, quality, and return on net assets; and finally, leverage existing technology investments, such as enterprise resource planning (ERP) systems, laboratory information management (LIMS) databases, data historians, and batch records. It simplifies the batch-auditing process with the use of standardized manufacturing documentation. Using a powerful query engine, it identifies process exceptions in real time or anytime after the batch run is complete. Dynamic reporting capabilities enable automatic report generation of details by using built-in trending, tabular data output and statistical features. These solutions are flexible and easy-to-configure, enabling authorized individuals within a company to visualize and share reporting data in a secure, customized environment. These Record-keeping systems can help manufacturers collect, track, and update information that proves they are complying with the regulations. They help manufacturers quickly retrieve that information if they're audited and reduce the time it takes the FDA to review the records. 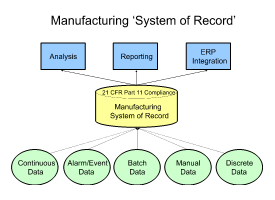 In fact, integrating fully digital systems that comply with 21 CFR Part 11 into processes can add millions to the bottom line. To avoid product recalls, fines, and FDA warnings, companies can now take one step forward by implementing such systems. The future is on-line, digital auditing from anywhere and at any time.